Coffee Any1? : Can't paypal and google just get along? Like anyone I want to be able to track my conversions based on goals I set out. My goal is for people to reach a "thank you for ordering page" right after they submit payment. Simple no? If they reach this page my google analytics "goals" should count that as a conversion. Google is so off from the sales registered in my paypal account that it's not even funny! I mean huge off. 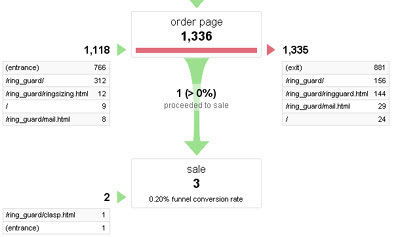 So far, if I believed google, I had 1300 viewers follow through my "funnel" to the purchase page. Google then tells me only 3 people ended the cycle on the thank you page. Paypal of course tells the real story - the truth is in the bank - as they say. So why isn't paypal bringing people to my thank you page after submiting their order like I asked them to (actually they offered in the button customizations). Why is google obviously counting people who "checkout" as "exits" (from my site to paypal BEFORE the sale). Why is it that I can only customize the header image and background color in paypal buttons? Why can't I put my google tracking code on the paypal payment page...(hmmmmm)? I could just pull a Bobby McFerrin "...naaa na na na nananaaa dont worry...nannanaaaaaa...be happy" but I really would like to take advantage of googles other tools like "website optimization" where I can create test pages. Find out what converts best - how best to present my Ring Guards to my customers - lots of neat stuff. If you know I'd love to know.